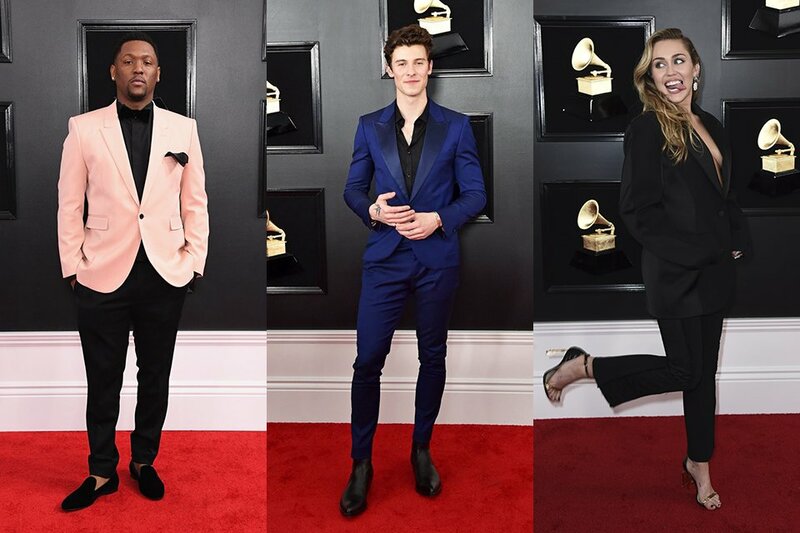 Whether you are into the bright and bold or the subtler side of fashion, this year’s Grammy Awards had it all. 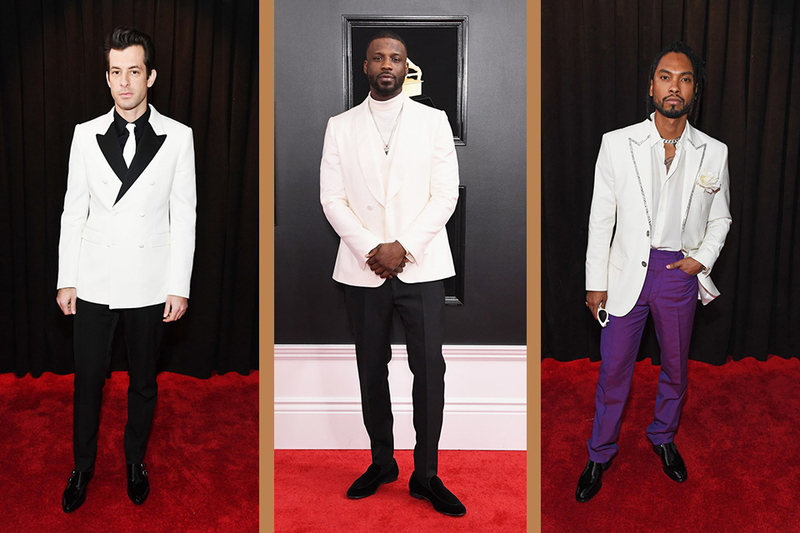 Below we have complied our favorite looks from the big night and how you can get the looks yourself for your next #CTN, Chart Topping Night (and yes, we just made that up). We are always a fan of the classic tuxedo look. It will always be a go-to look that is timeless, yet always able in subtle ways to be modernized. The first thing to note about these two artists is the fit of their tuxedos, they are slim-fit and tailored to perfection. 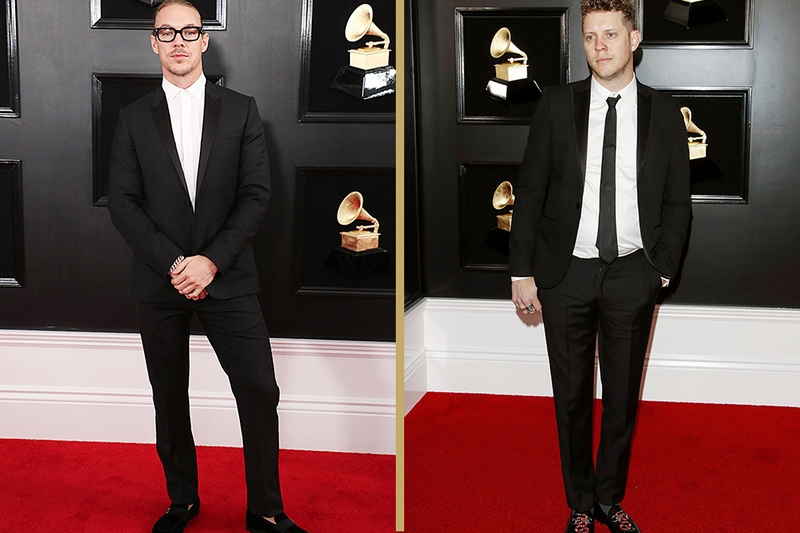 We love Diplo’s easy look with no neckwear and a simple velvet loafer. On the other hand we love the simplicity of Anderson East’s simple black skinny tie, paired with a loafer with a small serpent detail. A great way to play up a classic look is with accessories, and these men get 100% on our style test! What Jackets for the Win! White jackets are EVERYTHING right now! And we are loving how these dapper men paired their looks. Mark Ronson’s double-breasted jacket with black lapels is paired perfectly with a black shirt, black tailored pants, and a great shoe. Jay Rock may be one who finally convinced us that turtlenecks are in! His white jacket with white high-neck shirt and black pants look sleek and sophisticated. Miguel took his look to another level with a detailed peak lapel and purple pants. We are always a fan of color and mix-and-match looks, and were excited to see many artists take on this look. We are OBSESSED with these double-breasted jackets! They fit like a dream and are uber stylish! Zedd’s black velvet attire with a subtle embroidered print looks too sharp for words! He paired his look with simple accessories in order to allow the jacket speak for itself. 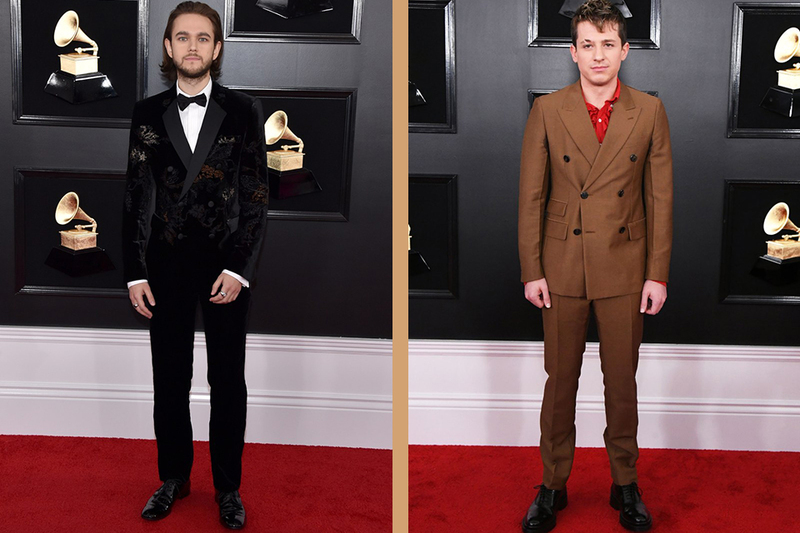 Where Charlie Puth’s camel-colored look gives us all the 70s vibes we didn’t realize we were needing, with a modern twist. The red detailed shirt and boot create a modern take on this retro style suit. 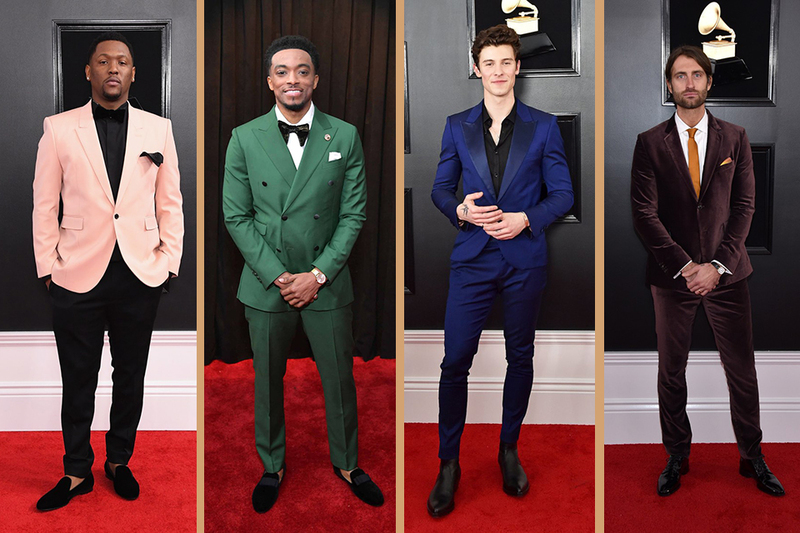 Artists at the Grammys were not afraid of color, and we were all about it! From blush, green, cobalt, and velvet…all perfect fits, all perfectly accessorized. These men showed us all that there is a way to do color that is both show stopping and sophisticated. That color can still be subtle and bold at the same time. 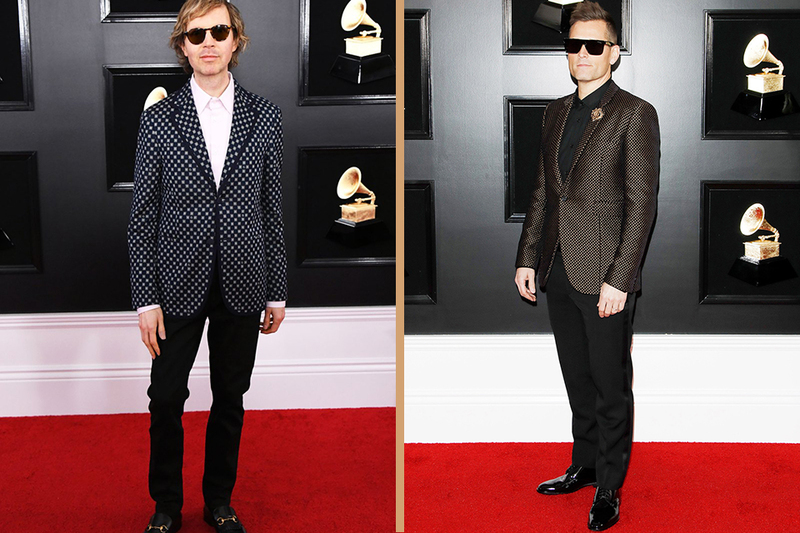 Both Beck and Kaskade hit the red caret in detailed jackets styled to perfection. Beck paired his retro-inspired black-and-white polka dot jacket with black pants and a white shirt. Where Kaskade paired his brown printed jacket with black pants and a black shirt, with a small and subtle lapel pin. These men also taught us that when you wear a printed jacket, a pair of sunglasses are the ultimate accessory. Keep your eyes peeled for our paisley printed tuxedos coming this Spring! ”Everybody! Rock your body right! 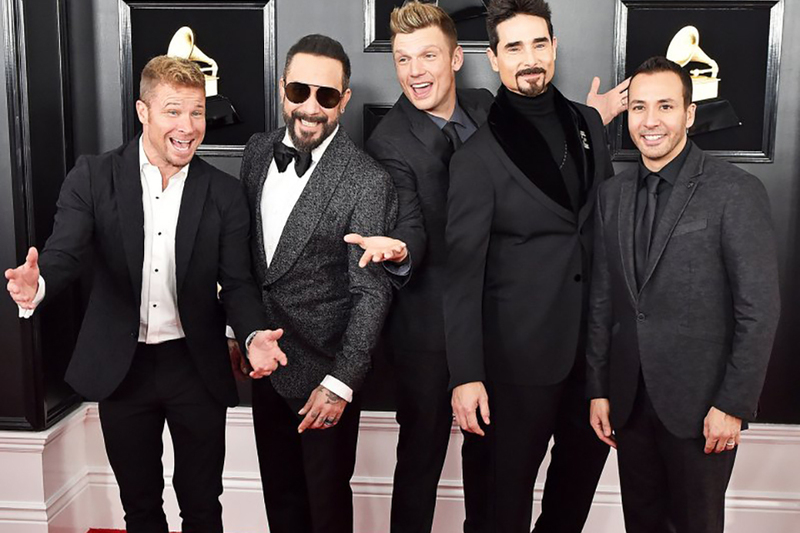 Backstreet’s back alight!” These men all wore simple and sophisticated looks that easily bring out the personalities of each bandmember, while still creating a cohesive look perfect enough for their neck album cover. We can’t stop out mouths from dropping every time we look at Miley Cyrus’ boxy tuxedo look. Her oversized jacket with a plunging neckline, paired with fit and flare cropped pants look amazing! Coming in like a wrecking ball, this fashion-tastic woman stole our couture hearts.